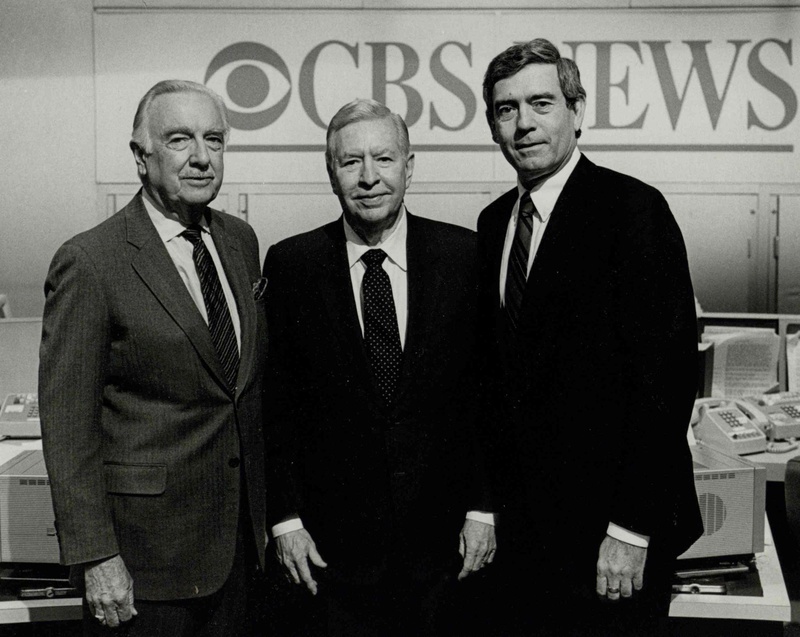 Three generations of CBS anchormen: Walter Cronkite (1962–1981), Douglas Edwards (1948–1962), and Dan Rather (1981–2005). Rather (Dan) Papers, Box 77 Folder 5_0002, Howard Gotlieb Archive, Boston University. The history of CBS television news was marked by its presenters and anchors. While these only changed a handful of times during the first fifty years of the program, the transitions were significant. CBS first experimented with a biweekly fifteen-minute program, Richard Hubbell and the News, that could only be seen by a few people in New York in 1941 on WCBW. CBS’s first regularly scheduled nightly newscast on August 15, 1948, the CBS Television News, was anchored by Douglas Edwards. A couple of years later the name was changed to Douglas Edwards with the News. In 1962, Walter Cronkite became the anchor of the CBS Evening News with Walter Cronkite for nineteen years, achieving unprecedented notoriety and influence, and remembered for his nightly signoff “And that's the way it is.” Dan Rather succeeded Cronkite on March 9, 1981. As the network experienced radical changes in the 1980s, the format of the evening news changed, and the network experimented with a co-anchor format with Connie Chung, who worked with Dan Rather from June 1993 to May 1995, before going back to a single anchor. Rather eventually stepped down on March 9, 2005, exactly twenty-four years after his first evening news. Still image of the CBS Evening News with Walter Cronkite, 1968. Retrieved from http://logos.wikia.com/wiki/CBS_Evening_News on March 13, 2017. 1981 logo for the CBS Evening News with Dan Rather. Dan Rather and Mark Cuban. Rather (Dan) Papers, e_rathe_00220, Briscoe Center for American History. Rather stepped down as anchor in 2005.